US futures are pointing to a higher open today after ending lower on Tuesday. Investors shrugged off trade war concerns following the firing of Rex Tillerson as US Secretary of State, and are looking ahead to economic data. A week after the implementation of import tariffs on steel and aluminum, markets fear — based on a Reuters report — that President Donald Trump is considering imposing tariffs on up to $60 billion of Chinese imports in the technology and telecommunications sectors. The S&P futures gained 0.24% to 2,775.25, Dow futures rose 0.35% to 25,115 and Nasdaq advanced 0.42% to 7,087.75. Elsewhere, shares at Asian markets closed lower on Wednesday, while European stocks are trading higher. On the European economic front, data from Eurostat showed that Eurozone industrial production slid 1% on month in January after rising 0.4% in December. The INE data revealed that Spain’s retail sales grew 2.2% annually in January after rising 0.6% in December. Istat data showed that Italy’s retail sales value fell 0.5% on month in January after falling 0.9% in December. Destatis data revealed that Germany’s consumer price inflation slowed to 1.4% in February from 1.6% in January. On the Asian economic front, data from the National Bureau of Statistics showed that China’s industrial production grew 7.2% in the first two months of the year after rising 6.2% in December. The Cabinet Office data revealed that Japan’s core machinery orders value grew 8.2% on month in January after falling 9.3% in December. The Ministry of Commerce & Industry data showed that India’s wholesale price inflation eased to 2.48% in February from 2.84% in January. 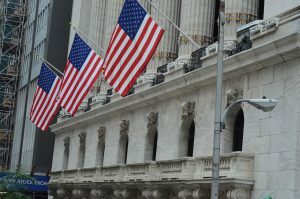 On March 13, US ended lower, with Nasdaq down 1% to 7,511.01. Dow fell 0.7% to 25,007.03, and S&P 500 tumbled 0.6% to 2,765.31. Trump’s decision to fire Tillerson has renewed geopolitical concerns that hurt the Wall Street. The Labor Department report showed that consumer price index rose 0.2% in February after rising 0.5% in January and core consumer price inflation eased to 0.2% in February from 0.3% in January. Meanwhile, key economic data that will be released today include the Mortgage Bankers’ Association mortgage applications index, producer price index – final demand, Commerce Department’s retail sales report, Atlanta Fed business inflation expectations, Commerce Department’s business inventories, and Energy Information Administration petroleum status report. Express Inc. stock jumped 9.46% in the premarket after better-than-expected fourth-quarter results. On the corporate front, Ford Motors stock rose 4.08% in the premarket after expectations that the automaker will lay out product plans for the next two years, and Morgan Stanley upgraded the stock to overweight. Signet Jewelers stock tumbled 6.07% in premarket after it unveiled a restructuring plan to be carried out over the next three years and issued weak earnings guidance for fiscal 2019. United Continental Holdings stock declined 1.03% in premarket after one of its flight attendants forced a dog into an overhead bin leading to the pet’s death, which is drawing considerable flak. Express Inc. stock jumped 9.46% in the premarket after better-than-expected fourth-quarter results. Cleveland-Cliffs stock slid 1.23% in premarket after brokerage firm Vertical Group downgraded the shares to hold from sell. On the earnings front, key companies reporting earnings today include Adidas, FutureFuel, Signet Jewelers, Vera Bradley, 3D Systems, Semtech, and William-Sonoma. Crude oil futures is up 0.84% to $61.22. Gold is trading down 0.09% to $1,325.90, and silver is down 0.22% to $16.59. On the currency front, the US dollar is trading down 0.01% at 106.452 yen. Against the euro, the dollar is down 0.11% to $1.2378. Against the pound, the dollar is up 0.01% to $1.3964.